The Zanerian College offered classes throughout the year and encouraged prospective students to enroll when they had the money and time to see a program all the way through. The summer programs were particularly popular among those working as educators already, as they would have that time off for summer vacation. 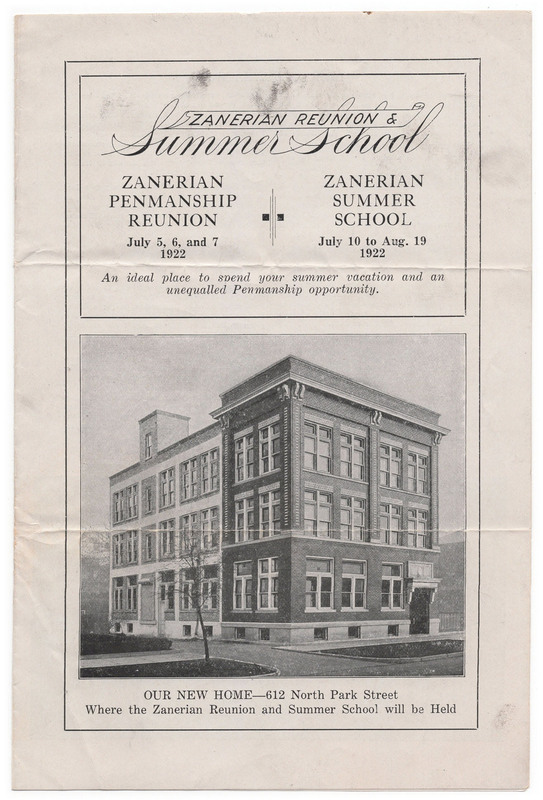 This is an informational brochure for those interested in attending the 1922 session of the Zanerian Reunion or the session for Summer School that started a week after. The brochure includes information regarding materials, boarding, courses offered, etc., and provides an interesting perspective into the way classes and sessions were structured. Please remember that while this booklet is within the public domain, it is the product of years dedicated to the art of penmanship by the administration at the Zanerian College. It is our privilege to have such samples to study, and the materials within should be used respectfully.